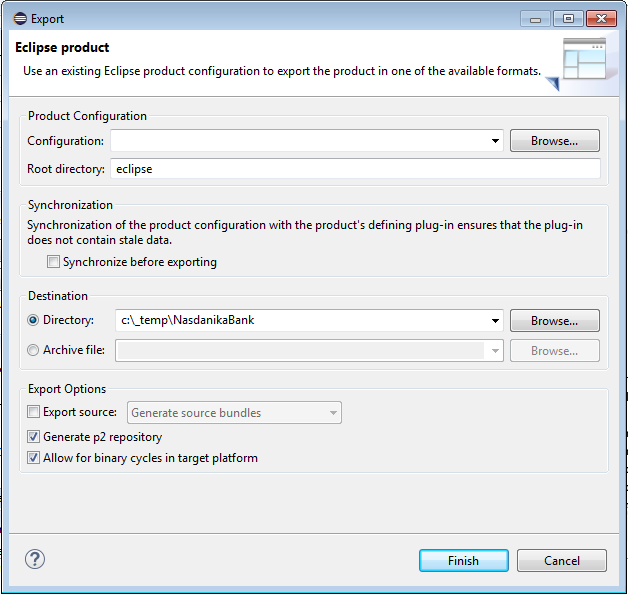 There are two ways to build an Eclipse product in Eclipse. 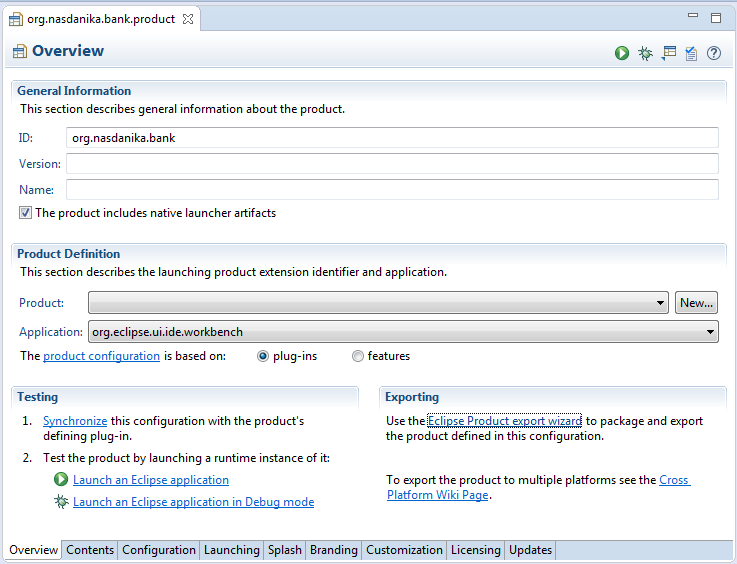 For this we&apos;d need to open the product file, in the Exporting section click on "Elipse Product export wizard" link. Uncheck "Synchronize before exporting", enter export location and click "Finish". A typical Maven/Tycho build is pretty straightforward - run mvn clean verify in the aggregator project and the build will produce an Eclipse product. Our build process is a bit trickier because we want our product to contain JavaDoc and test results. Therefore there are two pom.xml files which will be used and each will be executed twice with different goals. aggregator package The product parent requires the application repository even in order to execute the clean task. product.parent clean Cleans javadoc output directory in the doc project and test results output directory in the test results project. aggregator clean package javadoc:aggregate Generates aggregated JavaDoc and puts it to the doc project. aggregator verify Builds bundles, executes tests and stores them to the test results project, builds a repository. 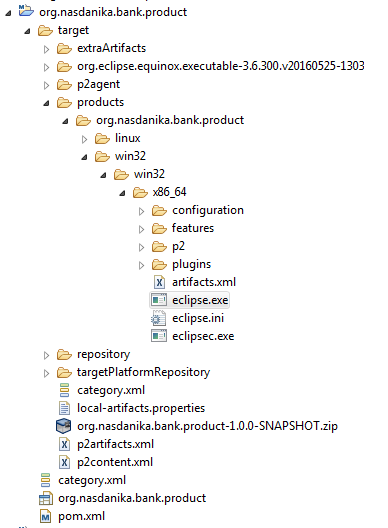 product.parent package Uses the repository from the previous step and doc and test results bundles to build an Eclipse product. The first row shall be executed only if there is no repository from the previous build, e.g. we build for the first time. However, in this case we don&apos;t have to execute product.parent clean. So when we run a build for the first time we can start from the third row. Tycho cannot load content from local repositories and we need to expose the repository over HTTP. It can be done in a variety of ways, e.g. by using a local web server like Apache. 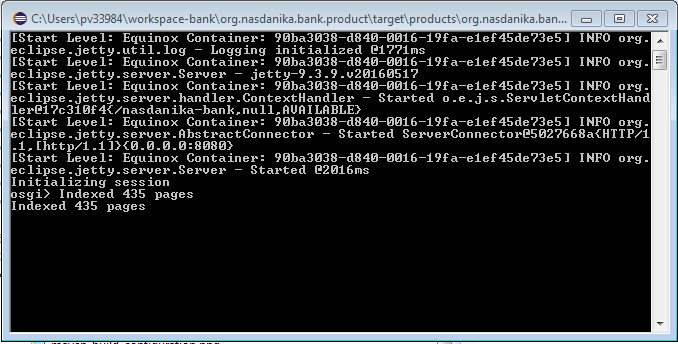 Perhaps the simplest way is to use Winstone Servlet Container. 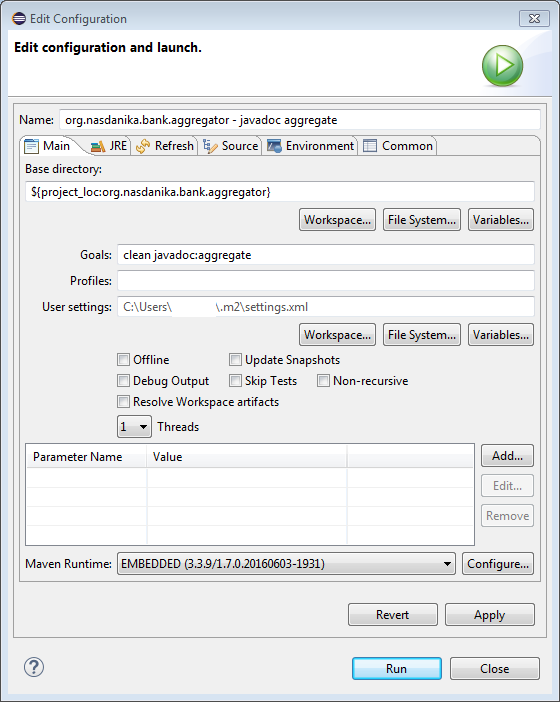 Once again we prefer to do everything from Eclipse and so we create another external tool configuration by duplicating the "Start Winstone" configuration and changing arguments to -cp <path to winstone jar> winstone.tools.WinstoneControl shutdown. Winstone port collides with the application port and therefore Winstone shall be down when aggregator verify is being executed. An alternative is to change Winstone port number. 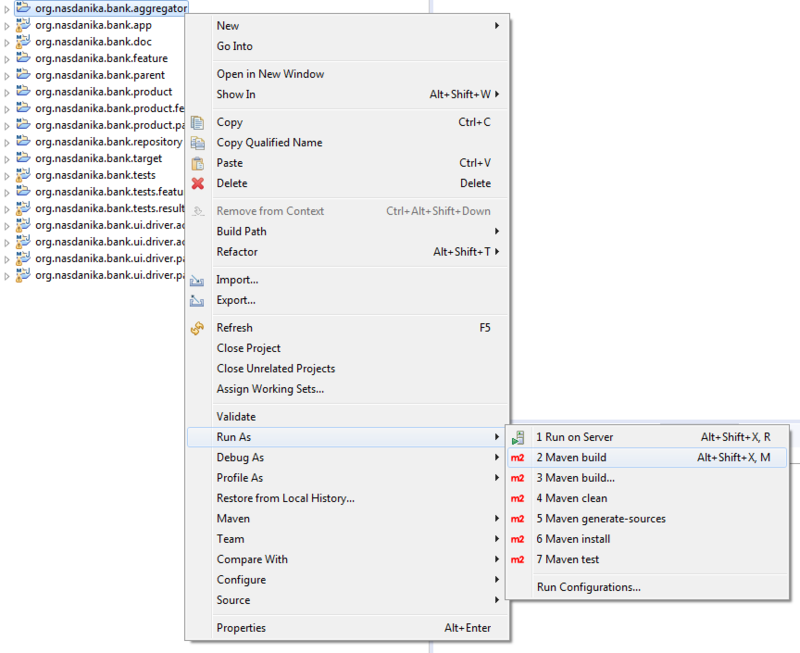 The section below show how to create build configurations. For the first build configuration for particular project right click on the project and select "Run As > Maven build", or use Alt-Shift-X, M hot key. 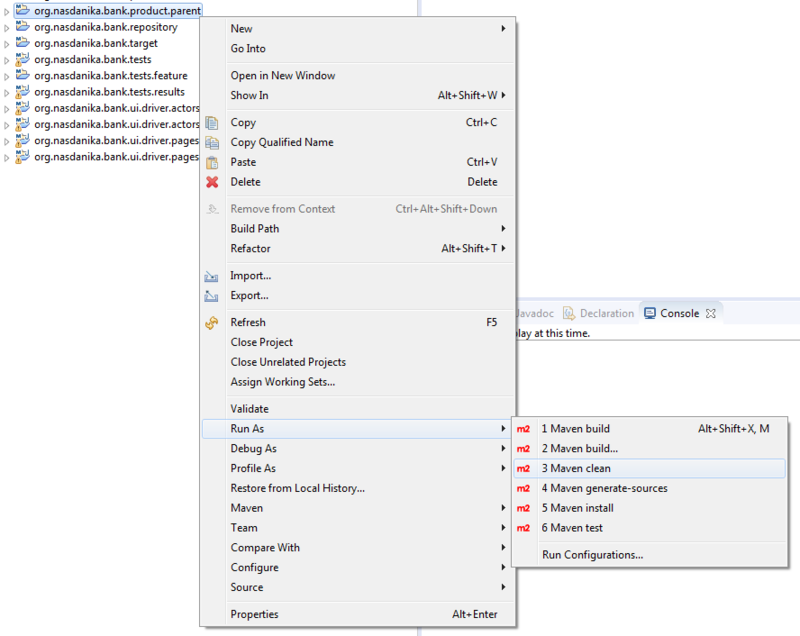 For subsequent build configurations right click on the project and select "Run As > Maven build...". 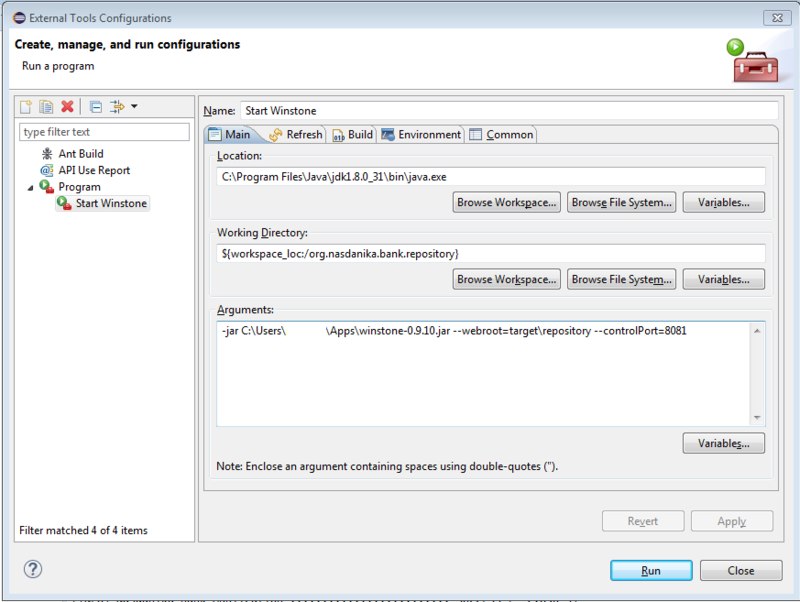 When the configuration dialog opens, modify the launch configuration name, if needed, and enter goals. 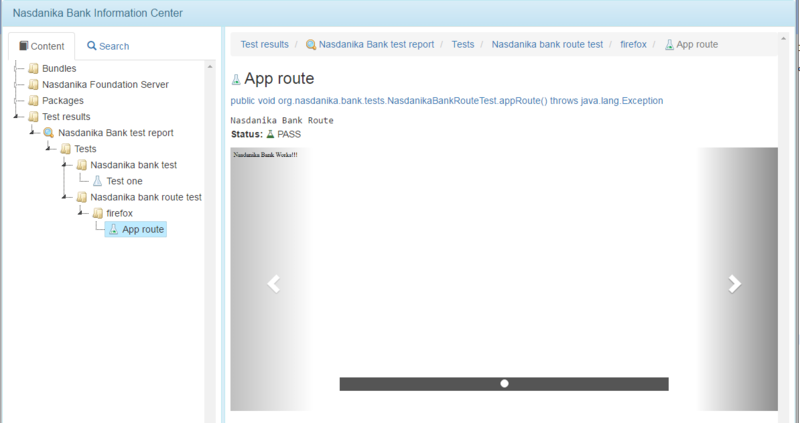 To validate that the application is functional we can open either the test route URL (http://localhost:8080/nasdanika-bank/router/nasdanika-bank.html) or the documentation route URL (http://localhost:8080/nasdanika-bank/router/doc.html) in a browser. Fully qualified name of the session class linked to JavaDoc (which is also packaged with the product). The JavaDoc is generated with source links, i.e. it takes two clicks from the report to tests sources. Node where the test was run. Pie chart depicting distribution of tests statuses. Currently there is one pending test and one passed. Tests can also have "Fail" and "Error" statuses. A table listing tests in the session with links to details, description, and status summaries for each test. These tests are also available under the "Tests" sub-node of the test session node. Actors tab - not present because we don&apos;t have any actors participating in tests yet. Note that a pending test icon is an empty flask, and the status glyph-icon is a gray flask. The details page of a test with a given combination of parameters contains a table listing parameters - title (name), value, description, and type, a pie chart of method statuses, and a table of test methods with their statuses. 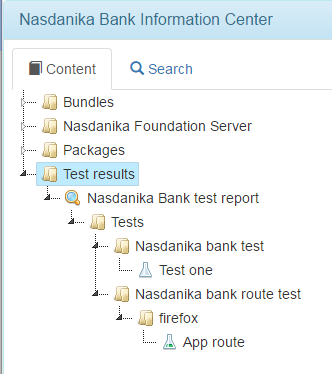 A click on a method navigates to the method details page. 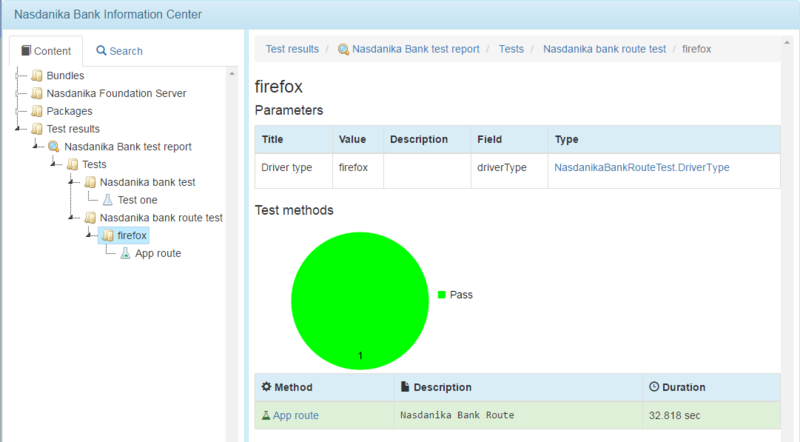 In the example above the test is passed - it&apos;s icon is a flask with green contents. The test details page contains a carousel with screenshots taking during the test, currenlty there is only one screenshot. A click on the screenshot opens it in a lightbox dialog. An image can also be opened in a new tab by right-clicking on the image and selecting "Open image in new tab" (in Chrome). 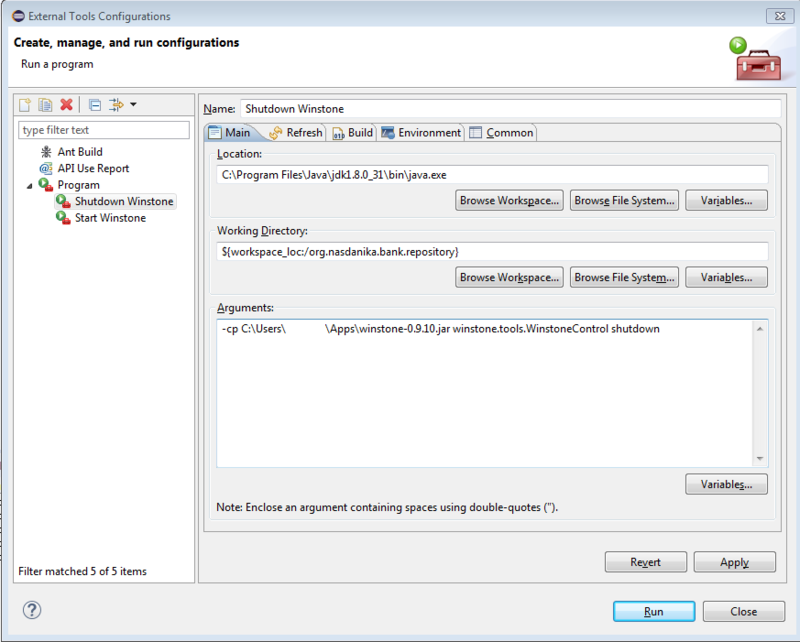 To shutdown the application type shutdown in OSGi console and press Enter. If the window doesn&apos;t close after a few seconds, type another command, e.g. ss and press Enter - it should close the window. We built a shippable product which can be deployed to Windows or Linux machines. The next step is to dockerize it.